We love markets. The frenetic nature, the amazing photo opportunities and the cheap fruit and veg. They provide a great introduction into how a country operates. However Colombia, you are a confusing place. The majority of time spent in markets, stores and even street corners here, is time spent confused. You see, your fruit is simply a little odd to those of us that have grown up in the land of apples and pears. And so, we just buy bananas...again. Thankfully, there is a solution to this type of bewilderment - and we were delighted when Real City Tours offered us the opportunity to finally get to grips with the exotic fruits of Colombia. Situated only a few minutes walk from Cisneros metro station, Minorista Market is the source for almost all the fruit you will see being peddled (literally) on Medellin's streets and in the restaurants. As the sun rises the street-sellers arrive here, powered by tinto, to buy and load colourful fruit into their wooden carts. Wander the streets later in the morning and you will find an abundance of them alongside their carts with fresh mango, passion fruit and avocados. Just as numerous are stalls with fresh juices and smoothies to quench your thirst. The market is full of life, and as we explored it's labyrinthian corridors with our tour group, it was easy to become distracted - a photo around not just every corner, but after every step. Juice-stained raspberry sellers reminiscent of bad slasher movies, glamorous arepa girls, the coolest grocer in Colombia and rustic baskets overflowing with vibrant produce. But, this day was about fruit. In a country with the world's most biodiverse selection and where just about anything will grow, we had a lot to learn. And, as it turns out, the best way to learn is with a spoon. We tasted around 17 of the most exotic and unique of Colombia's fruits that day, most of which we had never even heard of - some exquisite and now firm favourites, some that were so bitter they made our mouths pucker, one that required a hammer to open and another that necessitated safety equipment. The tastiest new discovery by far was the mangostino - something like a sweet lychee - which was so prized by Queen Victoria she would pay hundreds of pounds to any adventurer who returned with a basketful. We also learnt that mother nature can have a sense of humour. A number of fruits are claimed to have the ability to increase one's libido or help relieve constipation. Unfortunately, neither of us can now remember the details, a lapse which may lead to some less than romantic situations in the future. However, what we do now know is how to eat, peel and serve the fruit. The explanations given by the guide mean that we can now be a little more adventurous with the next fruit stand we encounter - and our morning bowl of granola is a lot more interesting! It certainly seems that there is more to Colombia's favourite fruits than we ever realised. And Minorista is an ideal place to do it. Whether it is that the relationships with vendors that have been built by Real City's tour guides or because they really didn't mind tourists getting in the way, we felt nothing but welcome amongst its stalls. People seemed genuinely happy to have us there, exploring their heritage and their livelihoods, with only the odd look of bewilderment as we took the 20th photo of the same fruit. Food, of all types is as deeply ingrained in Colombia's heritage as it is across the rest of Latin America, and the tour recognises this. Not simply limited to fruit, the guide takes the time to weave the stories between food and culture - we hear tales of grandmothers grinding corn whilst we stand and marvel and people doing just that, thankful that machinery has not yet made history of every precious tradition. Towards the end of the tour, we get to holster our spoons and enjoy fruit the way it is normally ingested in Colombia - in the form of a juice. With the ubiquitous heaping of extra sugar of course - apparently threats of an impending diabetic coma is the only real way to prevent the shot of added glucose. A number of weeks ago we were in our 9th hour of travel, on a hot and stuffy bus where the air con ceased to exist sometime in the 1990s. We were handed an ice cold glass of the most delicious and refreshing fruit juice we've ever had - the random assortment of vowels our untrained ears picked up when we asked for its name meant we thought we'd never try it again. Turns out we did. In Minorista market! And it was just as delicious. Guanabana (that big green spiky fruit up on the left) is now imprinted into our minds - even if we do have to sing its name to a tune by the muppets to remember how to pronounce it! Cost: $40,000 (approximately $17). This includes a freshly made arepa, a fruit juice and all fruit sampled on the tour. Time: Meet at 9.45 a.m., tour lasts around 2.5 - 3 hours. How to book: Head on over to Real City's website, and book directly with them. You will pay on the day of the tour. We genuinely recommend this tour. 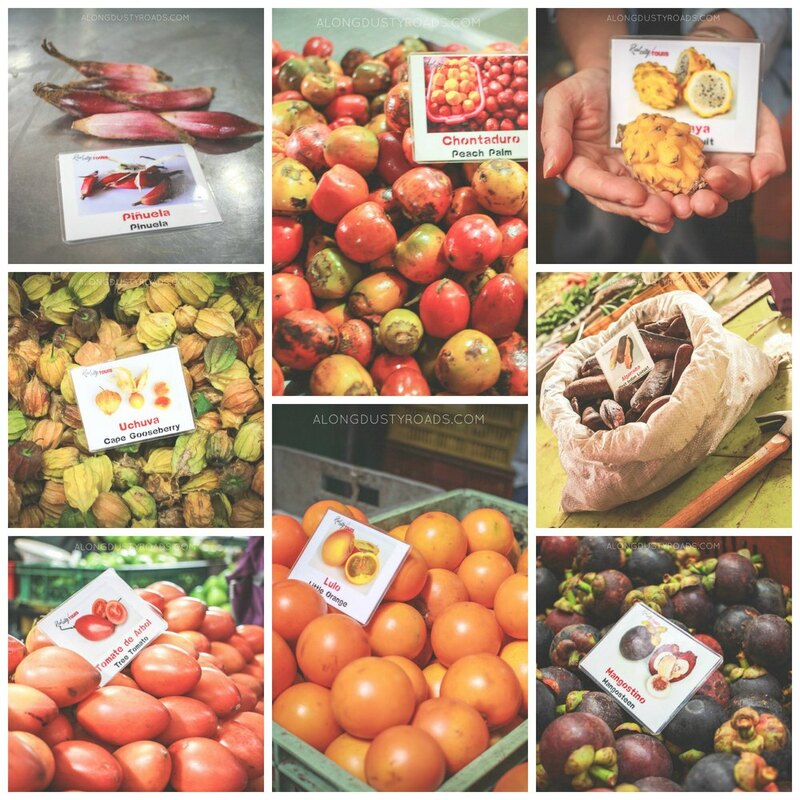 Not just for the fruits, but also an introduction to the heartbeat of many a South American town - the marketplace. Our guide, who spoke excellent English, was full of interesting stories and information. Real City tours also provide the popular Walking Tour of Medellin, the city's number one attraction on Trip Advisor. Although our tour was complimentary, we would never write a ringing endorsement without genuinely enjoying an experience. All views, photos and spelling errors are our own and cannot be shared without our permission.